With Enstella Export EDB to PST tool, you can move Exchange Mailbox to PST efficiently. Repair corrupt Exchange database and fix exchange database instantly and Export EDB to PST with all emails, attachment, calendar, contacts, tasks, notes, journals, appointments etc. Enstella Export EDB to PST software requires only priv1.edb file for extract EDB mailbox to PST. Export Exchange Mailboxes to PST - Extract EDB to PST from Exchange 5.0 to 2007. ...... EDB file to PST and export exchange mailbox to PST mailbox. Export Exchange mailbox to PST file server extract edb file from MS Exchange Server 5.0, 5.5, 2000, 2003 and 2007. * Compatible with MS Exchange Server 5.0, 5.5, 2000, 2003 and 2007. * Safe and secure conversion features. Export Exchange EDB to PST software to export edb file and helps to convert all the .edb database files which corrupted due to some reasons such as unexpected shutdown, application faults, virus attack and system errors. 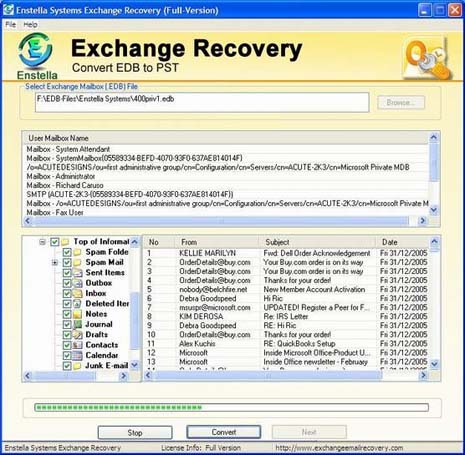 Exchange EDB Server Recovery tool is powerful MS Exchange EDB recovery software easily search & convert edb emails from Exchange Server. Qweas is providing links to Enstella Export EDB to PST 2.0 as a courtesy, and makes no representations regarding Enstella Export EDB to PST or any other applications or any information related thereto. Any questions, complaints or claims regarding this application Enstella Export EDB to PST 2.0 must be directed to the appropriate software vendor. You may click the publisher link of Enstella Export EDB to PST on the top of this page to get more details about the vendor.